Germany’s Lilium Jet is one of several GoFly competitors that has a flying prototype. Pratt & Whitney recently joined Boeing and other sponsors of the GoFly competition. The grand-prize winning project will receive $1 million in funding. The project organization administering the $2 million, two-year GoFly competition to create a personal device able to fly a human 20 miles safely—without recharging or refueling and using VTOL or near-VTOL capability—is hoping to attract additional corporate sponsors in the wake of Pratt & Whitney’s sponsorship of the $100,000 Disruptor Award for the most innovative team in the competition. Gwen Lighter, founder and CEO of the GoFly Prize organization, told AIN that, while “we have been very lucky to create such a strong network of sponsors” of the competition, “we certainly believe there is always room for growth. We will keep an eye out” for potential additional corporate sponsors “to provide support to the teams” as the competition moves into its second phase, which will award $50,000 prizes in March 2019 to four teams judged to have built the best prototypes. GoFly's network includes various companies and more than 20 trade/professional organizations. Judges from Boeing—the GoFly competition’s grand sponsor, which is providing all the prize money except for P&W’s $100,000 contribution—and other organizations chose 10 winners in June from 164 teams from 33 countries that entered the phase I conceptual-design stage in September 2017. Now, Phase 2 calls for teams to register their participation by December and produce prototype vehicles by February for evaluation by the judges. After the judges have awarded the four Phase 2 prizes next March, the competition will move into its final phase. Phase 3 will involve a flight-readiness review in September 2019, followed by a final fly-off competition later in the fall, at which point the judges will award four final prizes: the $1 million grand prize for the best overall fly-off score; a $250,000 prize for the quietest compliant entry; another $250,000 prize for the smallest compliant entry; and Pratt & Whitney’s $100,000 award for disruptive advancement. “It is important for people to know that teams don’t need to be Phase 1 winners in order to enter for phase 2,” said Lighter, pointing out that in addition to all 164 original competition participants, Phase 2 is open to entirely new participants as well. In fact, the competition theoretically allows entirely new entrants to apply to enter the final Phase 3 stage, though Lighter noted that because only six months will elapse from Phase 2 ending next March until the Phase 3 flight-readiness review takes place in September 2019, there is “more of a timeframe issue,” which might effectively rule any new participation out at that late stage. While only Boeing and P&W are providing the GoFly competition’s cash prizes, the project’s sponsors are supporting the competition in many ways, according to Lighter. Some companies are providing funding for program costs, while others are providing a long list of individual “masters and mentors.” Masters give monthly online lectures to participating teams on various aerospace subject areas and mentors work directly with the competing teams, providing tailored advice in their respective areas of expertise to assist the projects. GoFly’s many trade/professional association sponsors—a list which includes many aerospace-industry heavyweights, such as the Royal Aeronautical Society, GAMA, AOPA, AIAA, EAA, AIA, the Flight Safety Foundation, SAE International, and the International Council of the Aeronautical Sciences—also provide support in many ways, according to Lighter. This includes project mentors, communication and outreach, and hosting lectures and conferences on GoFly subject areas. When the GoFly competition ends, “The teams have the ability to take their flying devices and commercialize them in any way, shape, or form,” said Lighter. “We suspect several teams will align themselves with larger companies, and many teams will seek to commercialize on their own. So we accept there will be the start of a personal flying-device industry.” Lighter’s GoFly organization “will continue to help and support the teams in any way we can. Our purpose is to catalyze the transportation revolution that low-cost, efficient personal flying devices would create," she said. 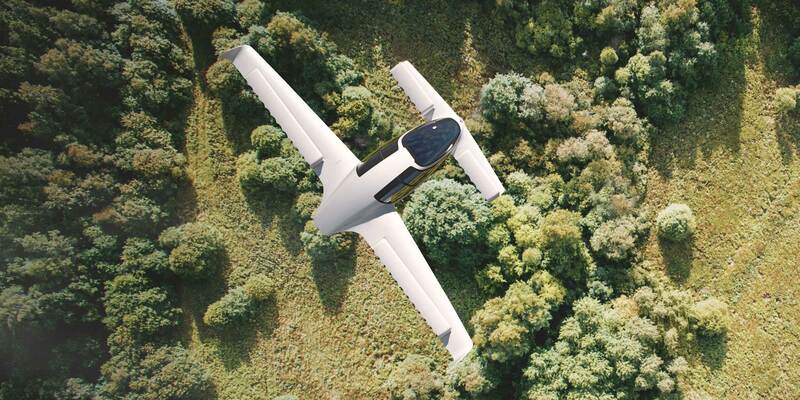 An increasing number of the experimental air taxis and flying cars under development have taken to the air in prototype form and are now being flight-tested. Among the projects already flying are those from well-backed but secretive California company Joby Aviation; Lilium Jet from Germany; the Intel-Daimler Volocopter, an autonomous vehicle that has completed manned test flights in Germany and will be trialed in Dubai’s Autonomous five-year Autonomous Air Taxi program; Kitty Hawk/Zephyr Airworks Cora from New Zealand; Airbus Vahana autonomous drone; and Chinese EHang 184 air taxi drone, reportedly set to begin passenger-carrying operations in Dubai in the near future. These projects and various others under development—such as the planned Mobi-One autonomous, tilt-wing project from Detroit Aircraft Corporation subsidiary Airspace Experience Technologies’ and Passenger Drone’s Autonomous Passenger Drone—are purely electrically powered and take-off and land vertically, but several other projects now under development are powered more conventionally. While the conventionally powered projects also offer VTOL or STOL performance, the aircraft rely primarily for propulsion not on electrical power stored in batteries but instead on the high power densities available from internal-combustion engines powered by gasoline or avgas. One such project, the PAL-V Liberty flying-car gyrocopter from the Netherlands, which is powered by two Rotax sport aircraft engines, is displaying a production example this week at the Farnborough Airshow. Another project, the Workhorse SureFly from the U.S., is powered by a hybrid gasoline engine that generates electricity to power motors which drive the aircraft’s fans and stores some of the electricity in batteries to provide backup power. Most of the projects already flying must be taken seriously because they are already being flight tested and in the near future might achieve type certification, while others have secured large amounts of investor funding or they directly involve major aerospace OEMs.